Joseph Carringer (Didgeridoo Music and Healing) to be Next Guest. 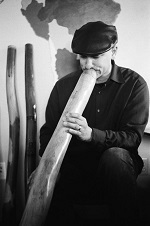 Joseph Carringer is a professional didgeridoo musician and sound therapist. In his sound therapy practice he uses concert class didgeridoos, combining Traditional Chinese Medicine meridian and organ theory with Ayurvedic Chakra philosophies creating a unique and powerful therapeutic sound, music and healing experience. Joseph has been playing an Australian Aboriginal didgeridoo for over 15 years, using it as a deep meditative tool in his personal shamanic journey as well as a therapeutic instrument for music and healing for his clients. Joseph presents and performs both nationally and internationally on mind/body connection and the effects of didgeridoo sound therapy for the purposes of clearing energetic and emotional stagnation within the energetic body to wellness and healthy life style seekers, as well as to medical and holistic professionals. After doing extensive research, Joseph opened his harmonic therapy practice to the New England Seacoast communities in January of 2004. Since the fall of 2005, Joseph has offered yearly classes for the Maine Medical CAM programs and the University of Southern Maine’s CAM programs, and presents at the University of New Hampshire and New England College. Joseph also volunteered music and healing at Maine Medical Center, Portland, ME on R-1 (cardiac) and Pediatric floor. Joseph has been on the internationally known author and psychic medium, John Holland’s Hayhouse Radio show several times as well as opened musically for many of John’s events. He was also a guest speaker at John’s Chakra-Healing class at Kripalu Center for Yoga presenting his Didgeridoo Chakra Clearing Workshop. Joseph began working with music and healing with the didgeridoo in 1997 with blues and jazz acts and later moved on to playing live breath percussion to electronic dance music with DJs. Currently he is performing and producing music with Josh Harris (major label remix producer and former music director/keyboardist for Seal) in a club/world fusion electronica group called Table Syndicate. It is Joseph’s goal to help people realign their bodies’ natural rhythms on a cellular level through harmonic therapy. He believes that through this work, people can achieve a greater sense of natural health and open doors for a higher sense of creativity and consciousness. He feels a deep natural connection with the healing of our planet and ourselves and has a variety of CD’s for sale. Joseph also spent nearly a decade in the hemp-based apparel industry as both a manufacturer and activist. Yesterday Dr Joel Kahn (left), Dr Albert Mensah (center) and Dr William Collinge were interviewed on the Holistic Hcealth Show. Research reported in the Annals of Internal Medicine last week concluded that massage therapy helps ease chronic low back pain and improves functioning. In the study 400 subjects in the Group Health Cooperative who had non-specific low back pain for at least 3 months were randomly assigned to one of three treatment groups. These were structural massage, relaxation massage or usual care (what they would have received routinely that was usually medications). The massage groups were given an hour long massage weekly for 10 weeks. After 10 weeks , over 1/3 of the subjects who received either type of massage said their back pain was better or gone. This compared to 1 in 25 of the controls who reported their back pain was better or gone. In addition, at ten weeks nearly twice as many massage patients as the controls on usual treatment reported functioning significantly better than at the beginning of the treatment program. They reported fewer days in bed, were more active, and used fewer anti-inflammatory medications than the group of usual care. Guests of Dr Carl O Helvie, Host, on the Holistic Health Show yesterday were Dr Richard Vincent (left), Ms Ginger Garner in a yoga pose (right), and Mrs Lynda Cookson (below). The interview with these guests follow. I hope you enjoy and learn from it. Dr Carl O Helvie, Host, interviewed three experts on yoga and massage on the Holistic Health Show last night. They were Elaine Masters (left), Dr Kathy Gruver (Right) and Peggy Hall (lower right). The interviews are below. Enjoy them. Peggy Hall was called America�s Ultimate Wellness Expert by Woman’s World Magazine. She is the featured health and wellness expert for the ABC radio network with her weekly wellness segment syndicated to 200 stations coast to coast. She is also a contributing writer for Clean Eating Magazine, and the creator of the Three Day Detox Diet. Dr Carl O Helvie will interview Cindy Holt as his second guest on the Holistic Health Show on Saturday. Cindy is a registered nurse with a baccalaureate in nursing, certification as a massage therapist from Mueller College in San Diego, and completed the course work for a doctorate in naturopathic medicine at Clayton College. She also finished programs in lymph drainage massage, and guided imagery. Her career in cardiac care nursing span 7 hospitals, a doctor’s office, home nursing and hospice care. She was the nurse manager of CCU at Pomona Valley Hospital for 16 years before finding massage therapy. She opened her own business in 1999 and worked for the Visiting Nurses Association in Claremont, California as a hospice massage nurse, and volunteered for various agencies in different capacities such as the American Red Cross. She has arthritis of the spine and never uses more than a rare Ibuprophen for it but keeps it under control with diet, enercise, yoga and supplements.